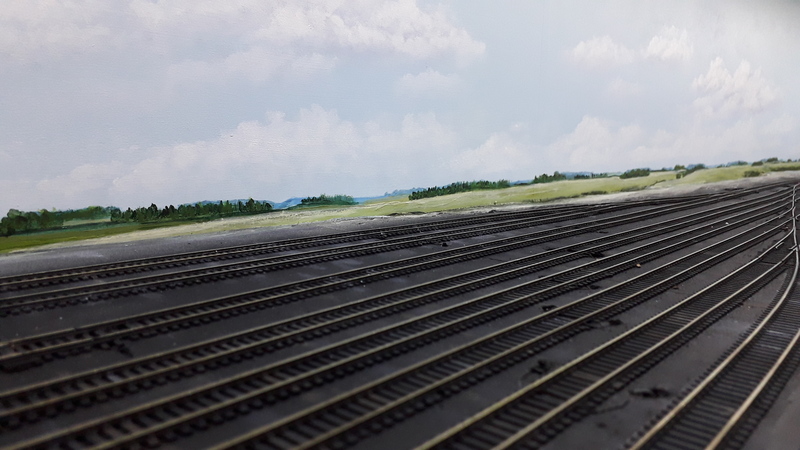 Things may have seemed quiet due to the lack of postings but I was busily working away on powering all the frogs of the 20 turnouts on the layout. I had hoped that this wouldn’t be needed but I found that even my best running locomotives were stuttering and stalling on many of the Atlas turnouts. I am currently running under DC so there is a possibility that this stalling won’t be an issue with the higher current of DCC but to be on the safe side I went ahead and powered all the turnout frogs in one big series of work sessions. I had read a few articles on using inexpensive micro slide switches to provide mechanical motion to the points while simultaneously routing power to the frog so I decided to give it a try on one turnout. When that worked I applied the same technique to all the others. 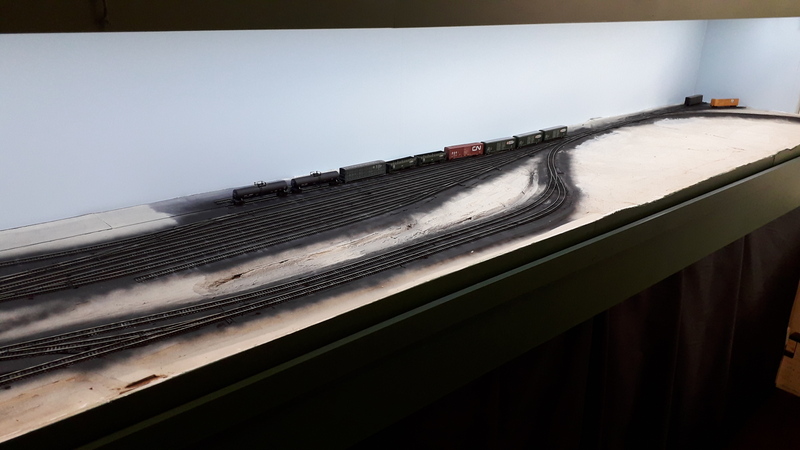 It took about a month of odd evening and weekend work sessions and the work was very repetitive and tedious so much so that I swore any other layout I build will have as few turnouts as possible. 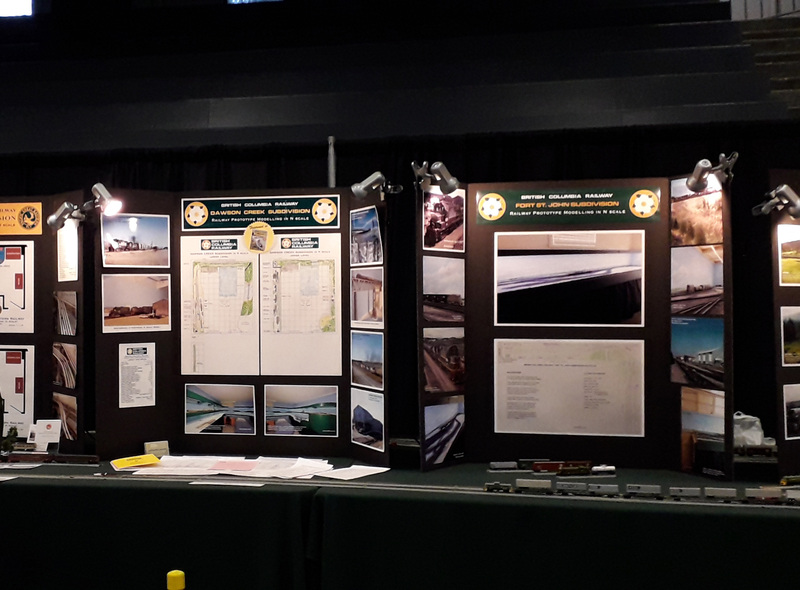 The power routing does work though and locomotives now crawl through turnouts at slow speed with very few stalls even under the very low current of slow speed DC power. 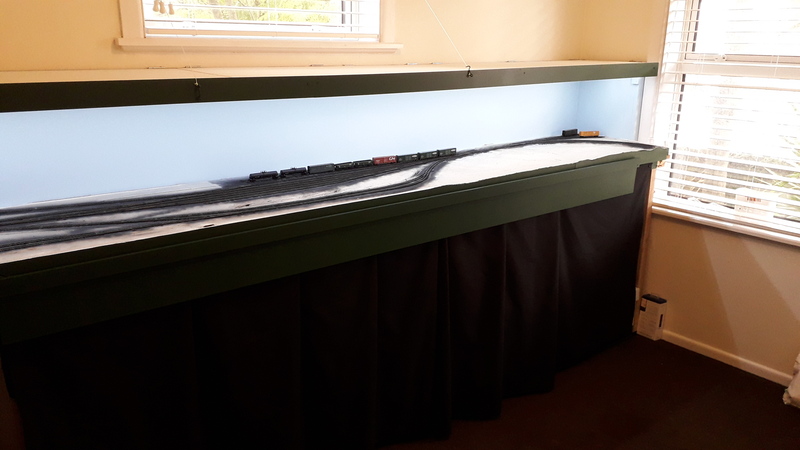 Another thing that really helped and that was purely accidental was my decision to use two layers of cork flooring as a sub-roadbed. 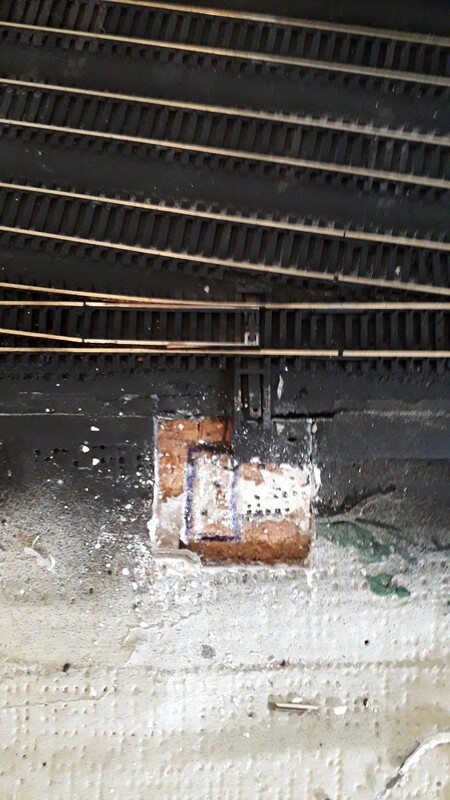 The thickness of the 2 layers was deep enough to accommodate the slide switches such that they were flush with the top of the roadbed. 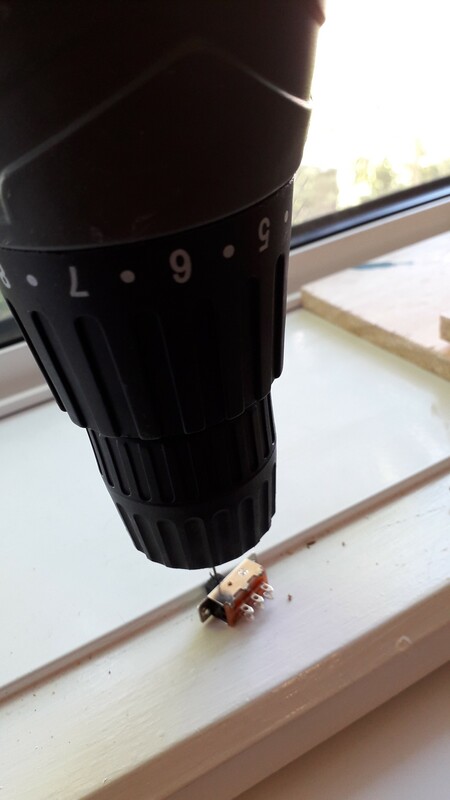 It also made switch installation easy in that all that was needed was to carve out a small rectangular hole in the cork. The switches just stay in the hole without any glue needed. 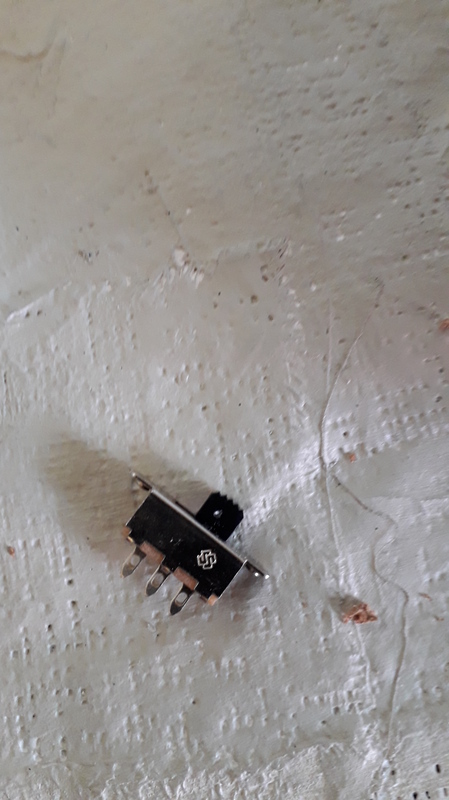 The micro switches I used are double pole double throw type switches bought for about $1.50 each at Jaycar Electronics in Auckland. Being New Zealand this is probably shockingly expensive relative to what you would pay for them in North America or the UK. Step 1. 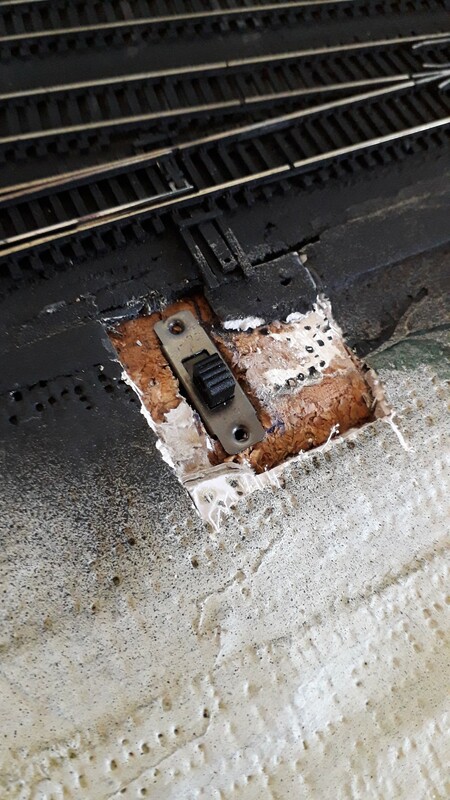 Cut away top layer of foam roadbed, exposing cork sub-roadbed beneath, Mark rectangular extent of micro slide switch and cut out hole through both layers of cork using sharp Stanley knife. Step 2. Remove slide switch and drill holes through the benchwork for the wires to pass through. I used a drill bit with a diameter similar to a drinking straw. Initially I drilled 2 holes but soon realized one hole would be sufficient for the 3 wires leading from the switch. Test fit the micro switch again to make sure it fits snug and flush. Step 3. Drill a small hole in the switch knob. I used a 0.8mm diameter drill bit which, although very delicate and fine worked OK in my standard drill. The switch knob plastic is very soft so drilling through it is easy. Step 4. 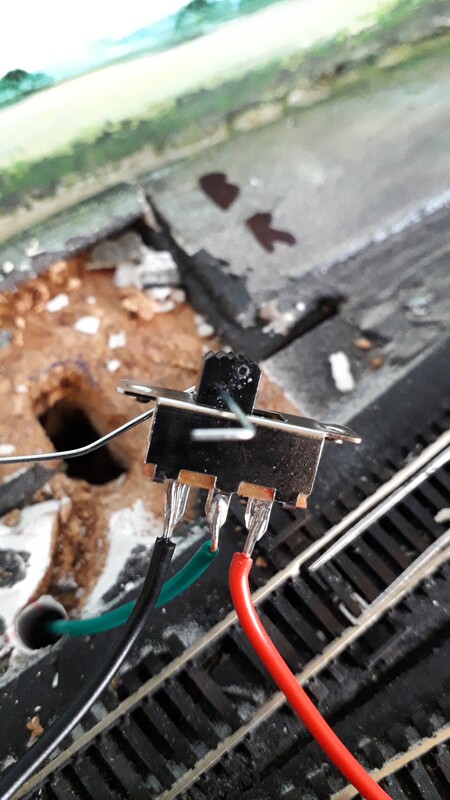 I cut about a 2 inch length of 0.7mm wire and fed it through the hole in the switch knob. Bend the wire 90 degrees so that it is snug around the knob. Make another 90 degree bend to point the tail of the wire in the direction of the turnout throwbar. Step 5. I cut a 2 inch length of standard drinking straw and fed it through the benchwork hole drilled earlier. The straw is simply there to make passing wires up and down through the interior of my hollow core door benchwork easier. 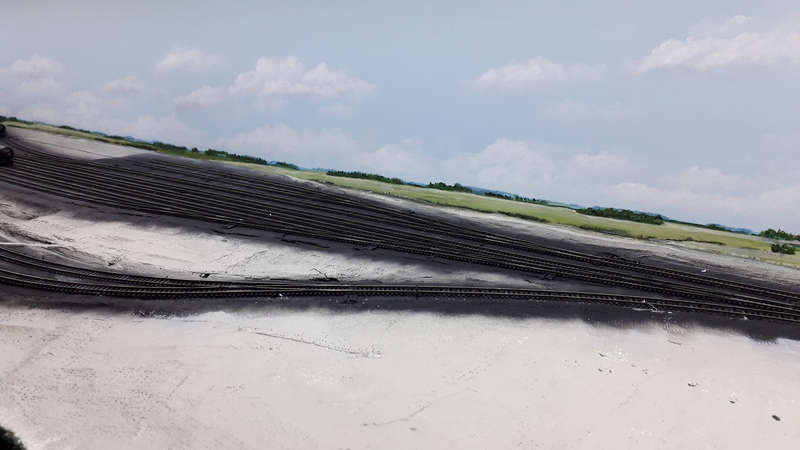 I then went under the layout and located the green frog wires I had dropped down during the tracklaying phase. i fed these up through the drinking straws until their ends popped out into view above the layout. Step 6. 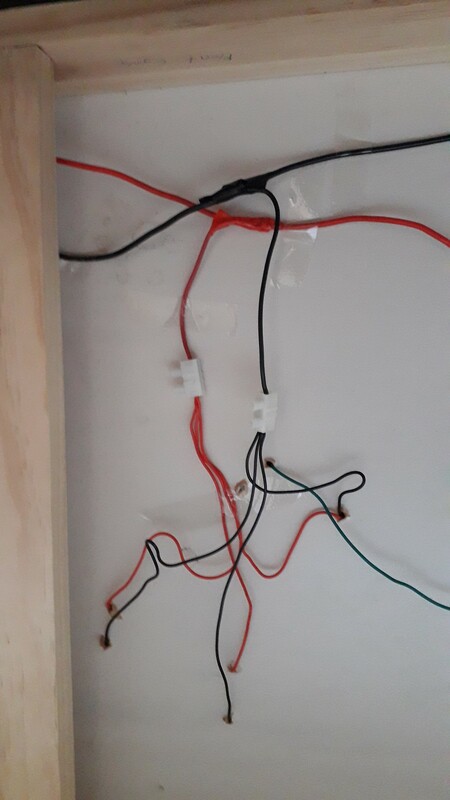 Cut lengths of red and black feeder wire to connect the micro switch to the bus wires underneath the layout. 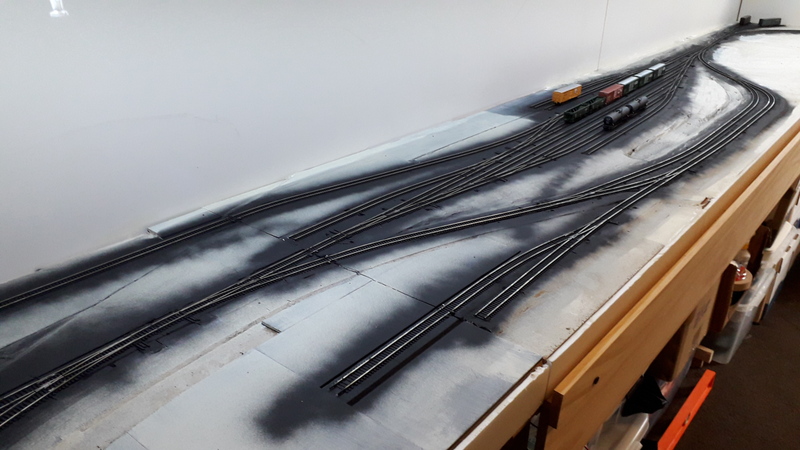 I started with 8 inch lengths and later trimmed them back under the layout before connecting them to the main bus. Strip and tin the ends of the feeder wires and the frog wire in preparation for soldering to the micro switch. Step 7. Solder the red and black feeders to the micro switch contact pins making sure the the polarity is correct. On my layout the red bus is along the front of the layout so I made double sure that all my micro switches were wired with the red feeder at the front. The green frog wire is soldered to the middle pin. 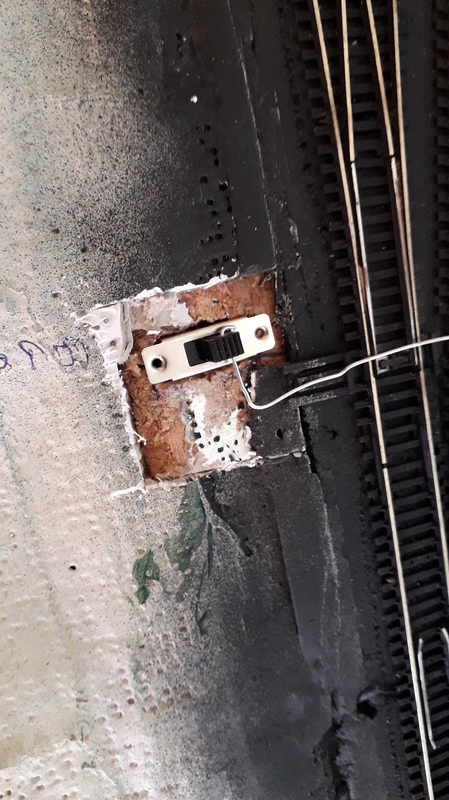 I used small pieces of foam wedged between the contact pins to prevent any wires from touching each other and causing a potential short circuit. Step 8. Pass the red and black feeder wires down through the drinking straws. Under the layout pull the wires through, trim away any excess length, strip and tin the ends and connect them to the main bus wires. 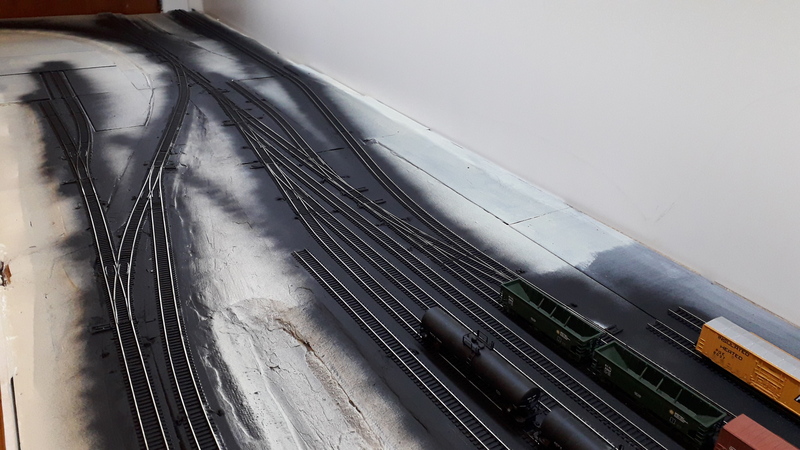 On my layout I use terminal blocks to connect all feeders to a sub-bus which connects to the main bus. 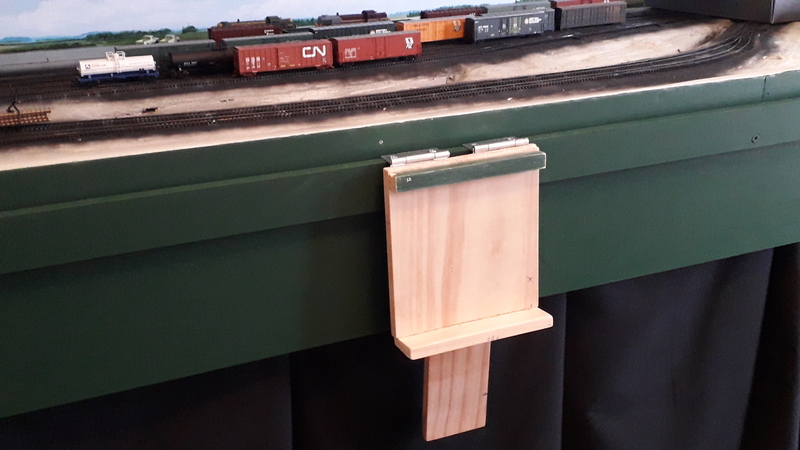 I simply fed these turnout feeders into terminal strips along with existing track feeders. 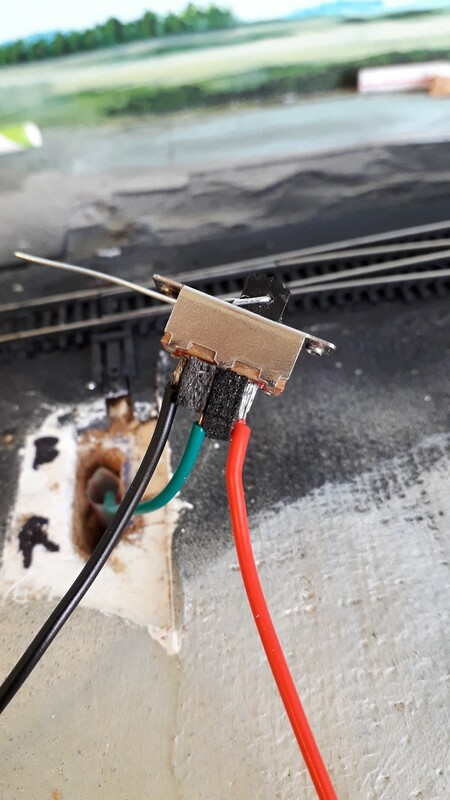 It is critical to test each turnout after the wires are connected to make sure there are no short circuits. 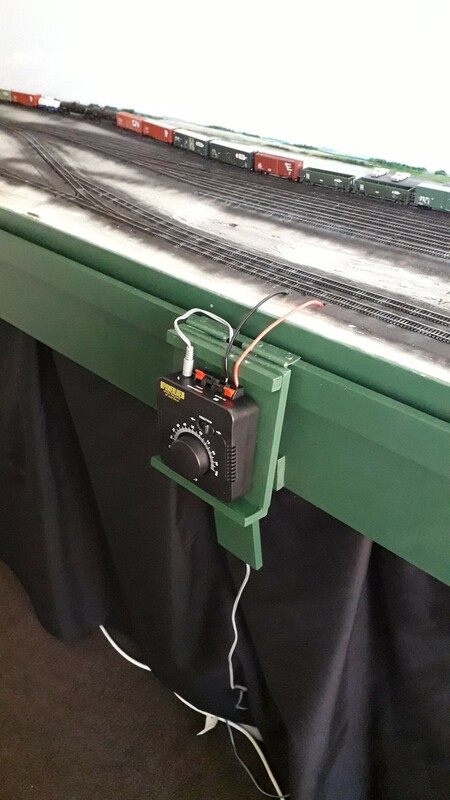 The micro switch is not physically connected to the turnout throwbar at this stage but if you move the switch and points independently in the same direction a locomotive under DC power should run smoothly over the (now powered) frog without stalling. If you reverse the position of micro switch without reversing the points then the locomotive will stall on the frog which is to be expected since the frog is now unpowered in that switch position. 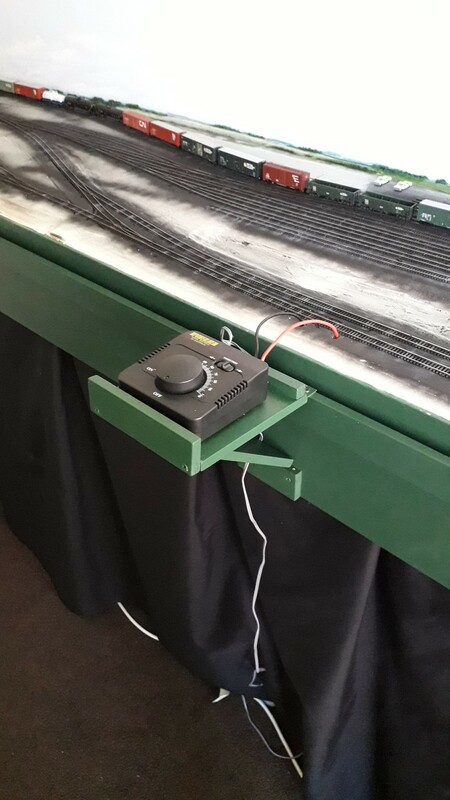 I typically ran a locomotive over a completed turnout multiple times through all possible paths and changed the switch position to both confirm (positively and negatively…excuse the pun) that the frog was being powered (or not powered) according to the correct motion of the slide switch relative to the points themselves. Step 9. Finally I trimmed and bent the throwbar wire from the micro switch to fit through the small hole on the Atlas turnout throwbar. Some adjustment is usually needed to get the perfect amount of throw and to get a good physical stop between the point and stock rails. In conclusion, although the process was incredibly tedious, the results were worth it. 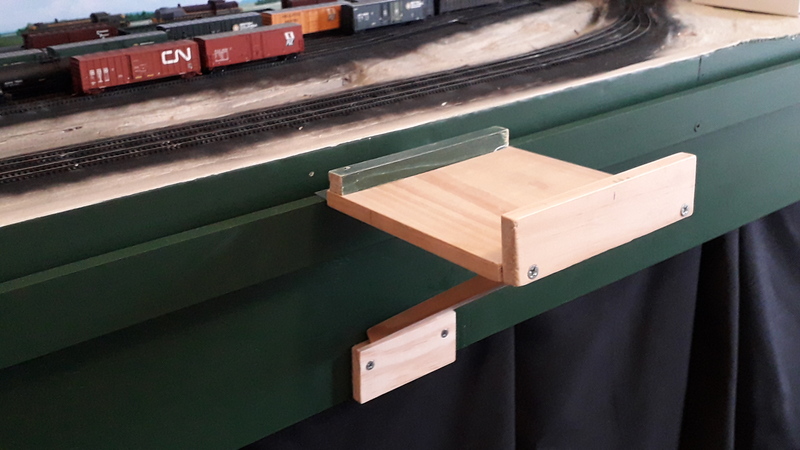 There are commercial products called Frog juicers available (they are for DCC only) that would have made this quicker but I went with the inexpensive but time consuming approach. 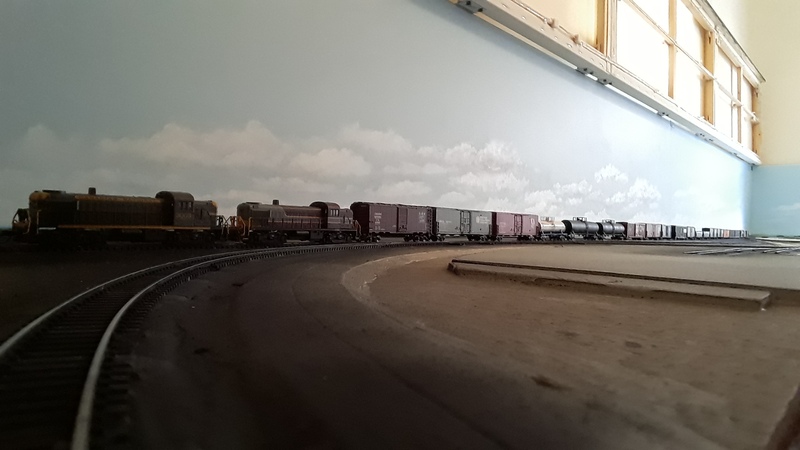 I am now moving on to installing the next section of benchwork that will hold the staging yard. There will be some frog powering needed on the turnouts there but that will be a few months away and it will only be a couple of turnouts. The plan for the Christmas break had been to complete the staging section of benchwork and lay the staging tracks. 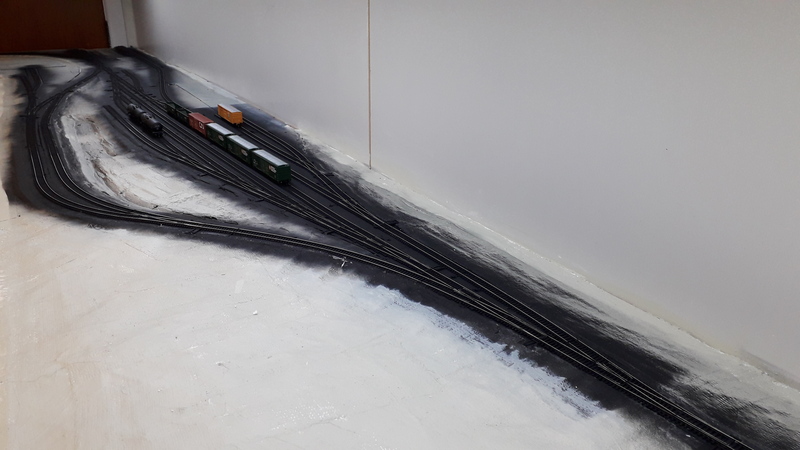 However I wanted the ability to get things running on the main yard first so I turned my attention to getting the yard tracks fully wired and operational under DC power. 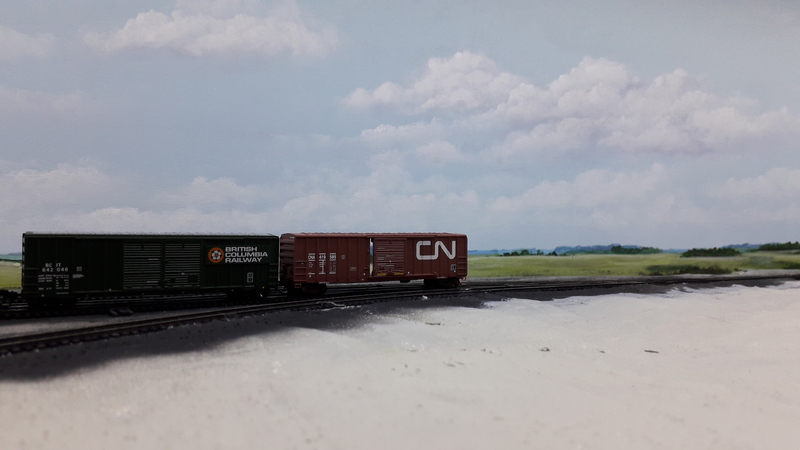 The layout is being wired for DCC but purchase of a DCC system and installation of decoders in locomotives is at least a year away, so in the interim I purchased a simple DC power pack and connected it to what will become the DCC main bus lines. 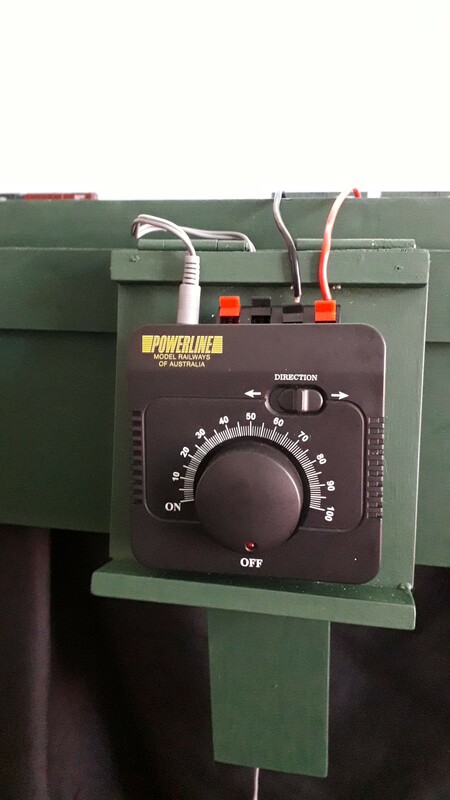 I made a fold-down holder for the DC power pack using some scrap pieces of wood and small hinges. 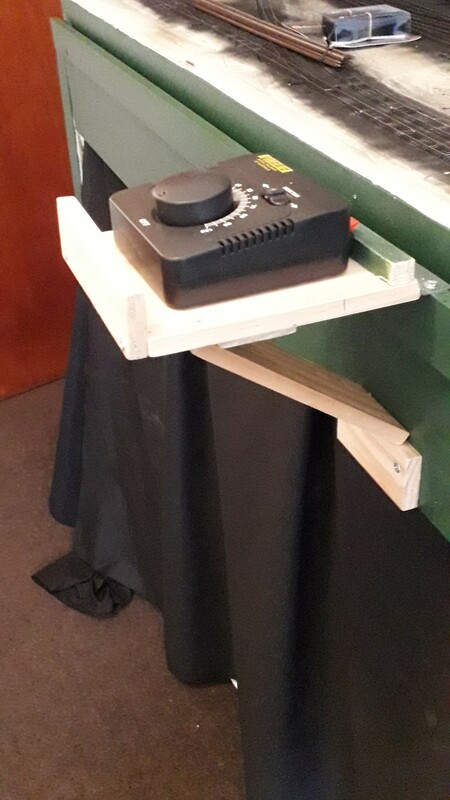 When operating sitting down (which is how the layout was designed to be viewed) the power pack is left in its folded down position. If operating standing up it is flipped up to horizontal. The lightweight power pack is simply mounted to the holder using Velcro strips. This holder will likely be removed when DCC throttles are acquired, but for now it looks great and works well. 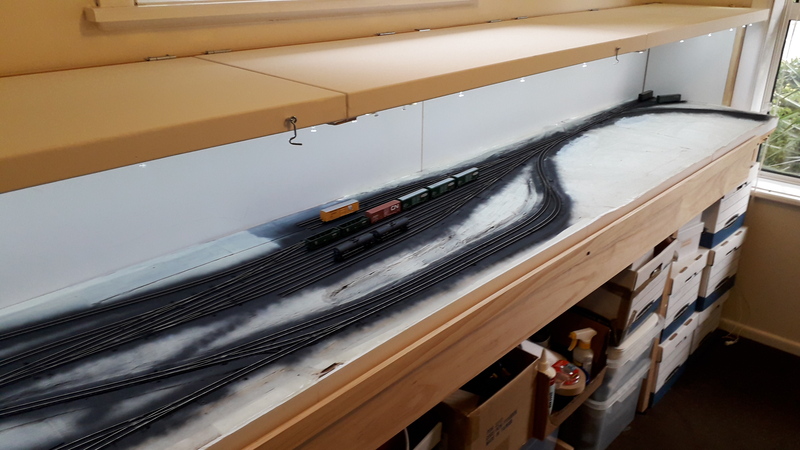 Best practice for wiring is to make sure every piece of track (no matter how short) has its own set of feeders. 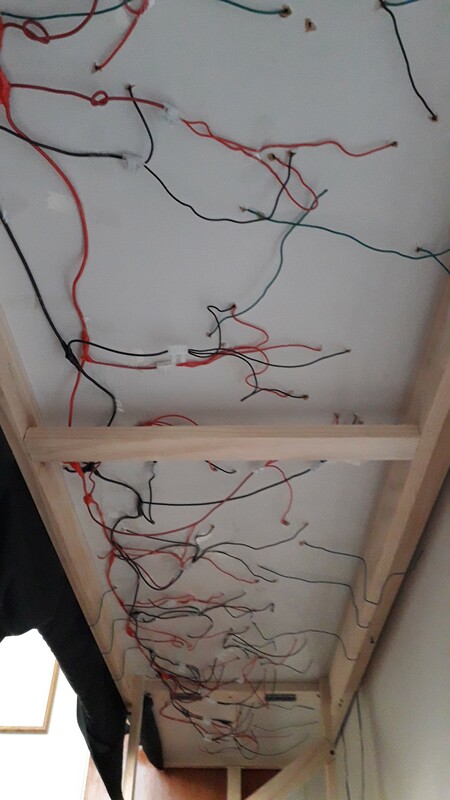 I followed this practice and the result was a huge nest of wires under the layout. Currently they have been roughly taped to the benchwork underside in order to tame them somewhat. 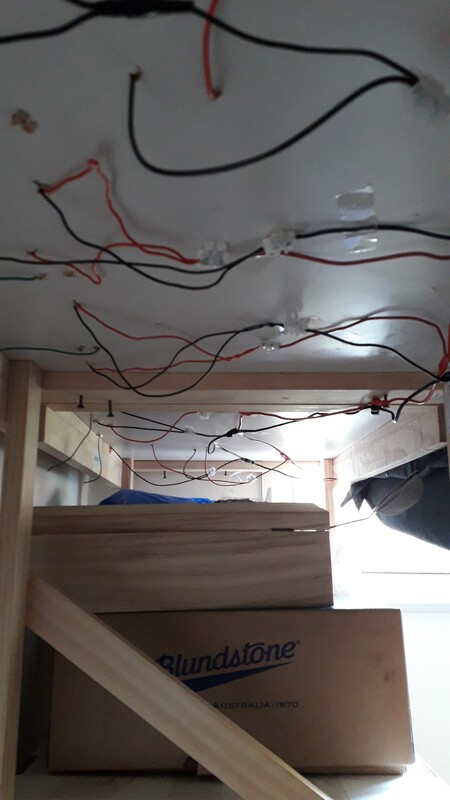 Eventually once the DCC system has been installed and is working the wires will be more neatly mounted. Wire gauge in New Zealand is typically expressed in mm diameter (not AWG), but the key wire gauges I used roughly translate as 14, 18 and 22 AWG. I used stranded 14 gauge wires for the main bus. Soldered to these at regular intervals were stranded 18 AWG pig tails. These pig tails were then connected via terminal blocks to groups of solid 22 AWG track feeders. On previous layouts i had just soldered everything together and never had an issue. 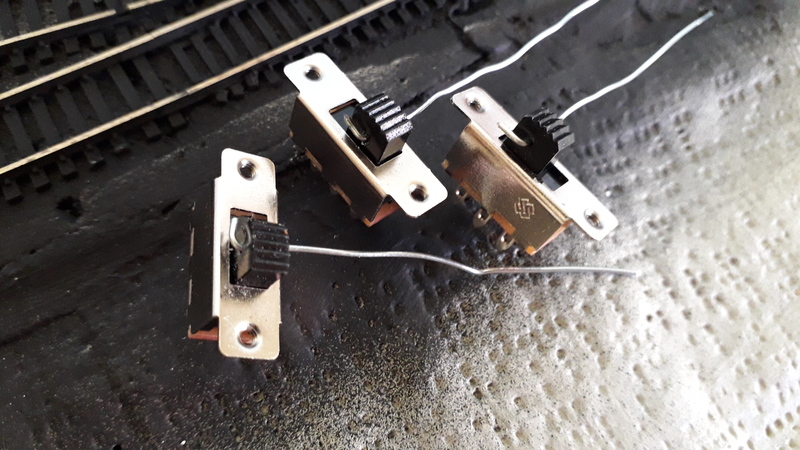 Having heard more than a few stories about mystery short circuits from hell where the only diagnostic tool was cutting soldered feeders, I decided that terminal blocks would be a better approach. 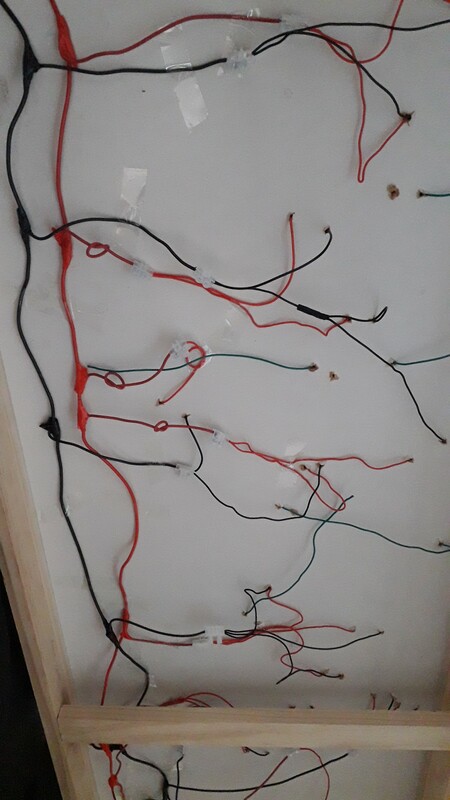 I also soldered green 22 AWG frog feeders from all the turnouts but these are not connected to anything yet. 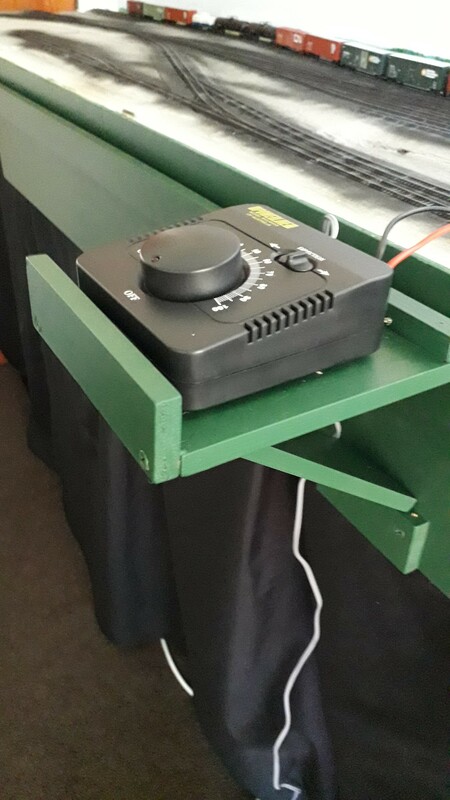 I am either looking at SPDT switch operated turnouts or using Frog Juicers. 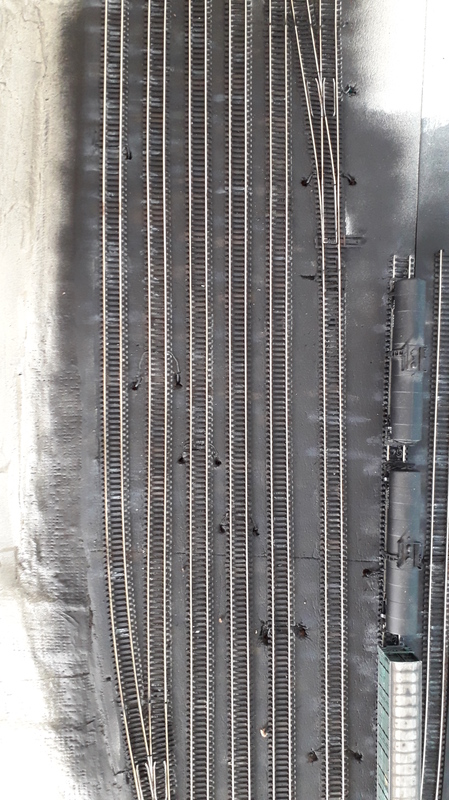 Note that all the track feeders were soldered to the track back during the track laying phase. They had simply been dangling in the wind for 6 months. Despite that step being complete, I had estimated that it would be a couple of weeks work to get the bus and feeders all connected together. In the end it took maybe 4 days working on and off in 2 hour blocks. 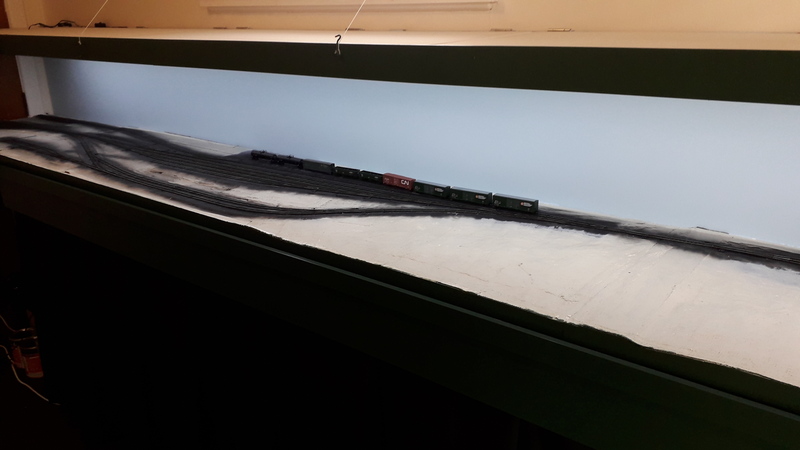 With the tedious wiring underway I cleaned up the layout room and placed some stock on the tracks and took some fun cell phone photos. I wasn’t going for artistic moodiness but a few of them turned out that way anyway. 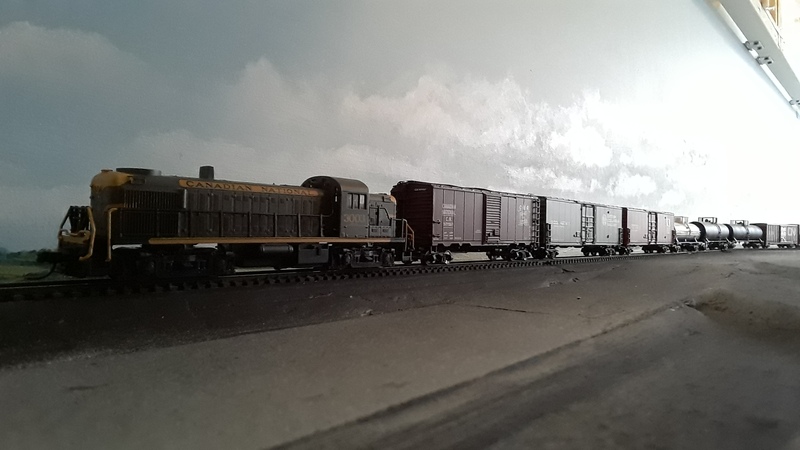 Apologies for use of CN and CP RS-3s though. They are just stand-ins until I get the correct BCR shells on. 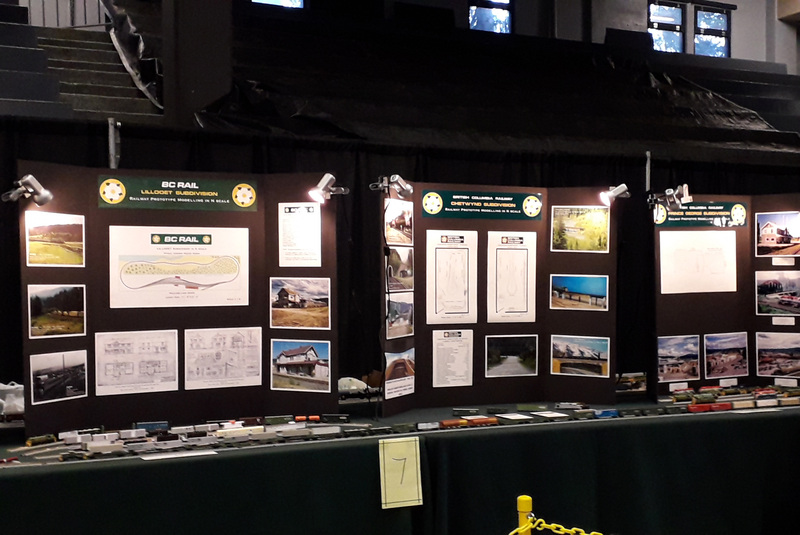 My first trip back to Canada in 3 years included a stop in Vancouver for the 2018 Vancouver Train Expo at the Pacific National Exhibition Forum. 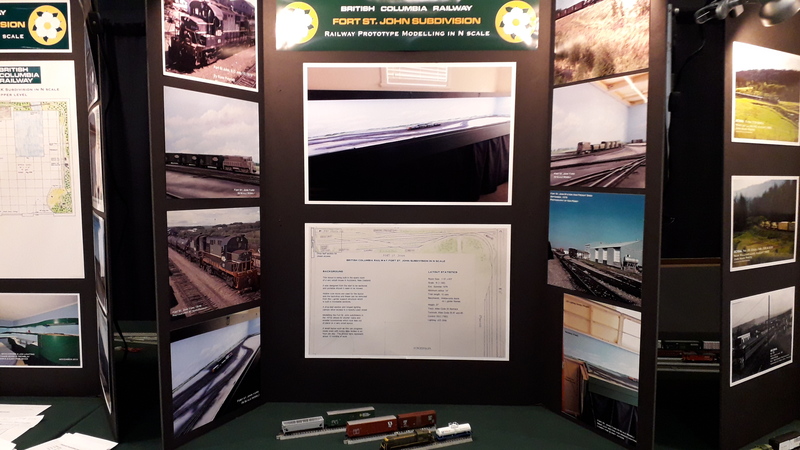 It had been 4 years since I last participated so it was great to catch up with everyone, see some great modelling and attend an operating session on the N scale Dawson Creek subdivision. It was also an opportunity to stock up on 1970s era appropriate equipment. I obtained a couple of Atlas Classic RS-3s that will be used with the Briggs BCR body shells. 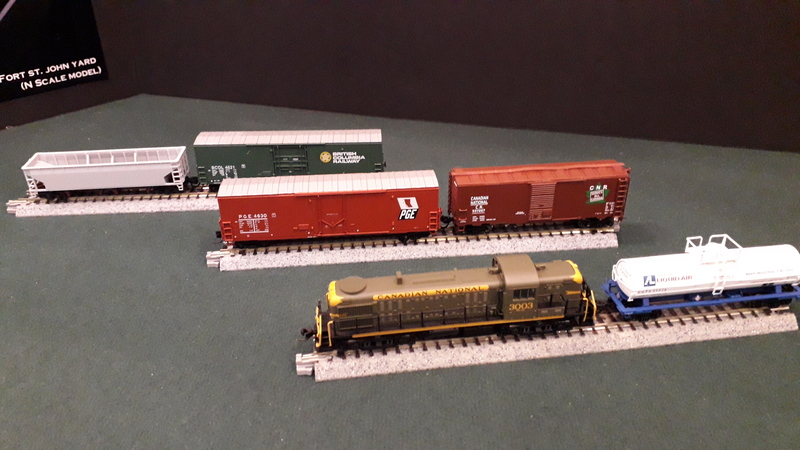 I also purchased a number of freight cars including some hard-to-find True Line Trains PGE and BCR boxcars and some CP and CN 40 foot boxcars that will be used in grain service. 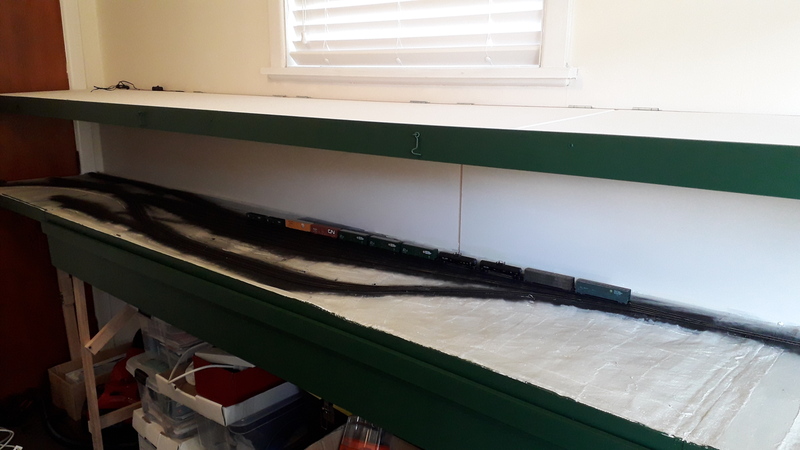 On the layout front, things will likely be quiet until the Christmas break at which point I hope to complete the staging shelf and get things running under temporary DC power. 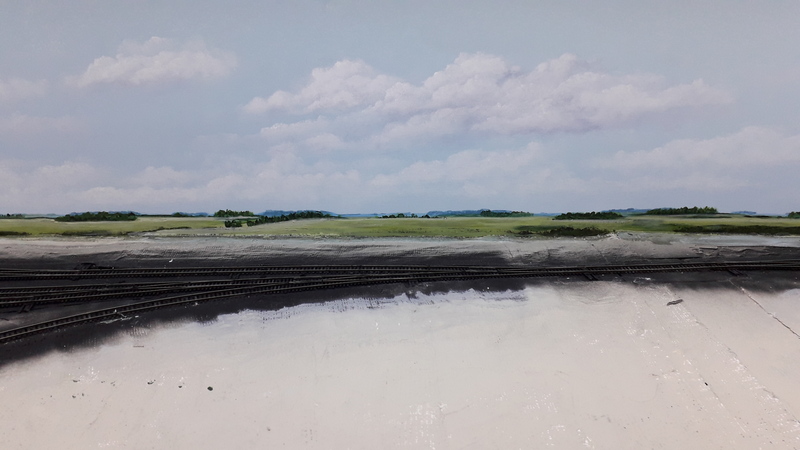 The last few weeks have seen the backdrop landscape and clouds finalized. Because the Fort St John area is so flat it was a challenge to get the illusion of distance while using a very low horizon line. 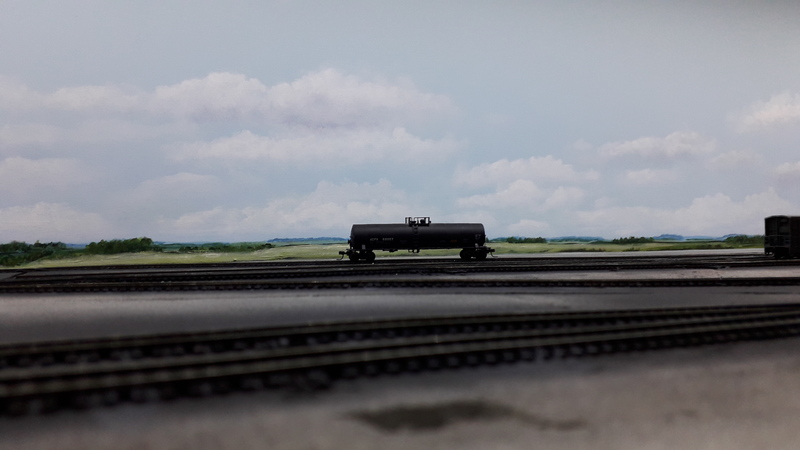 I followed the techniques in Mike Danneman’s book “Painting Backdrops for your Model Railroad” especially the sections on Midwest backdrops and clouds. I used standard acrylic artists paints and was able to get a nice late summer field colour scheme with minimal mixing. 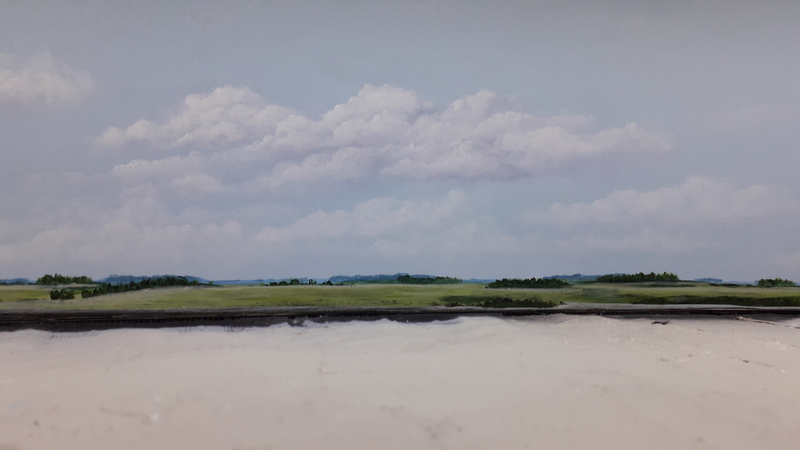 The clouds were a bit of a challenge to get right and a few isolated cumulus clouds I started with never looked right so I just gradually added more and more until I got the “Big Sky” feel I was looking for. In retrospect a plain blue sky would have been easier! 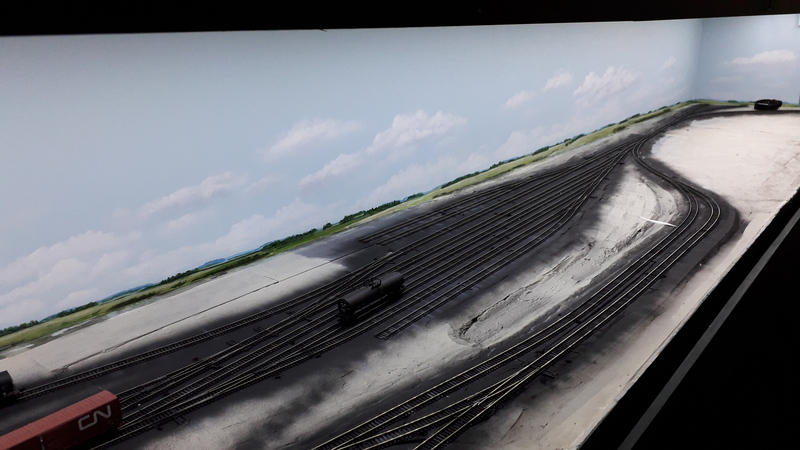 The last few weeks have seen the backdrop get painted a basic blue, some fabric skirting mounted along the front to hide all the various boxes and some painting and weathering of ties. The skirting was sourced from the Spotlight chain of NZ stores. Ties were weathered using inexpensive craft paints and was done by randomly painting ties various shades of grey and brown using both washes and dry brushing techniques. Spent the last few sessions painting the fascia and lighting canopy with a nice brunswick green. I considered some other colours but I have always used dark green on prior layouts and I see no reason to change. I feel like the layout presents itself very well now even in its unfinished state. 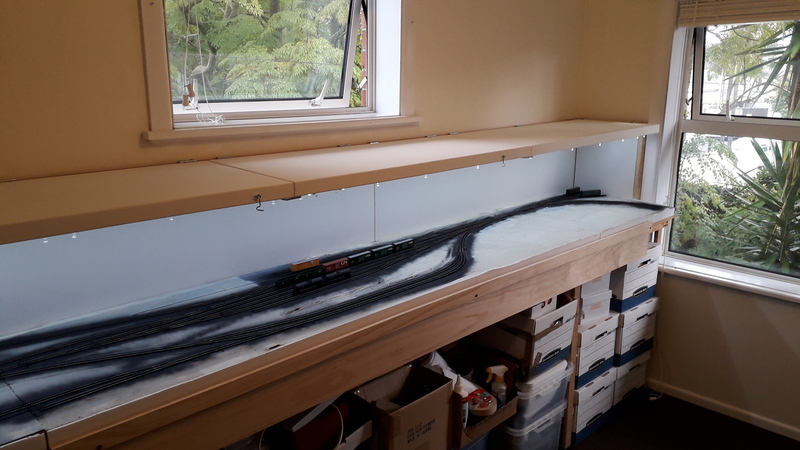 The next step is to get the backdrop painted in a basic sky blue before moving on to either some wiring or kit building. Several days to myself this week allowed for a burst of productivity. I finished what I call the “rough terrain”. This is either plaster cloth over cardboard webbing (for the east end of the yard), or pieces of foam roadbed sheets to form various flat industrial areas and building pads. 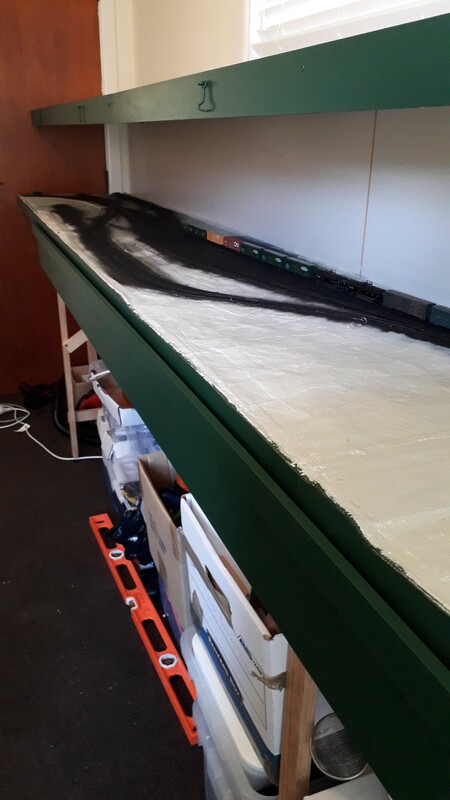 I used a general purpose filling compound (Spakfilla Rapid) from Bunnings to blend the roadbed into the terrain and to fill any gaps. 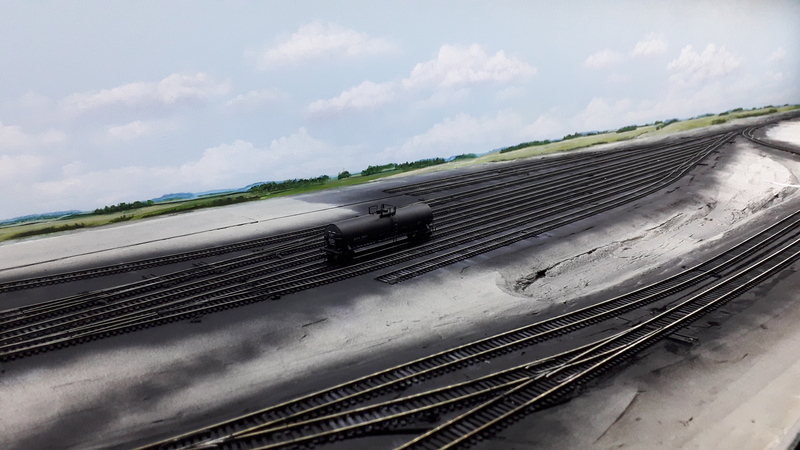 I painted the whole terrain with a rough coat of a generic beige colour that approximates the clay soil ground colour of that part of British Columbia. I just picked up a couple of inexpensive test pots from Bunnings. (Colour is Dulux of NZ “Linton” if any one wants to know). My intention is to eventually go over the rough terrain with sculptamold or a similar product and repaint with the same base coat. For now the goal was to get rid of the white plaster and black foam mashup look of the terrain. 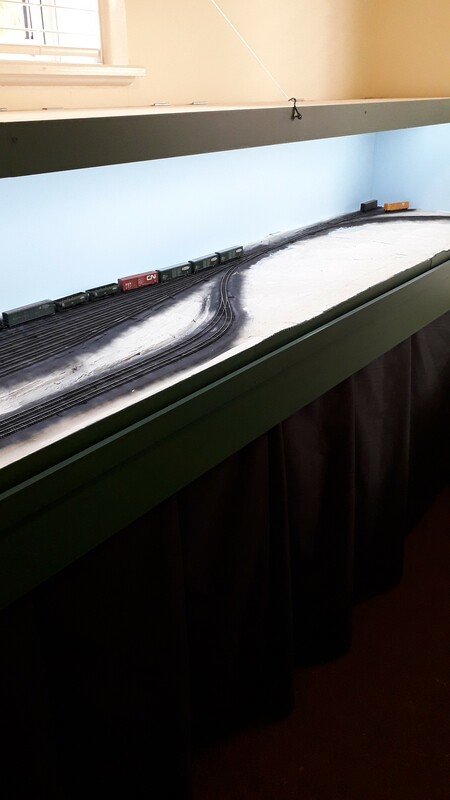 I pre-weathered the track the easy (but messy) way, using a spray can of Rustoleum flat black paint. This required extensive masking of the backdrop, fascia (and room walls) to avoid overspray. Proper ventilation is (obviously) required for this. 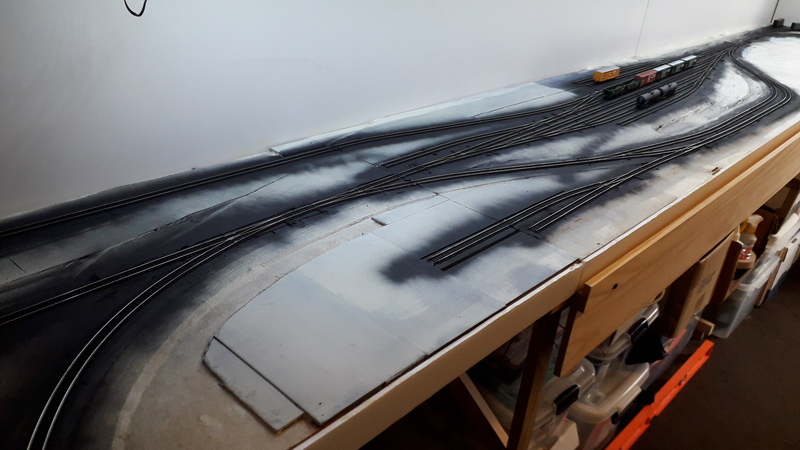 By working slowly, stopping frequently and spraying the track in small sections it is possible to do this without creating clouds of paint fumes. I also ran the vacuum cleaner and held the hose end near to where I was spraying. I am not sure if this actually sucked up spray paint fumes but it felt like I was at least trying. A key part of preparation is masking the point blades of each turnout so they don’t get covered in spray paint. I just used small pieces of tape on the point blades before spraying. 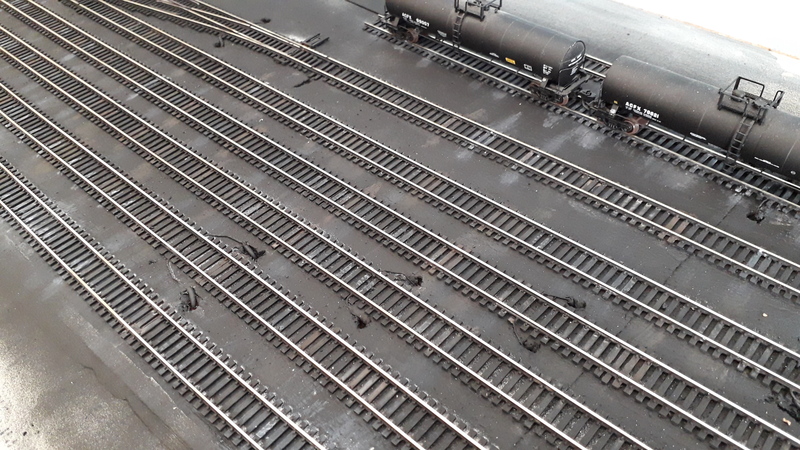 A standard abrasive track cleaner easily removes the spray paint from the rail tops after painting has been completed. 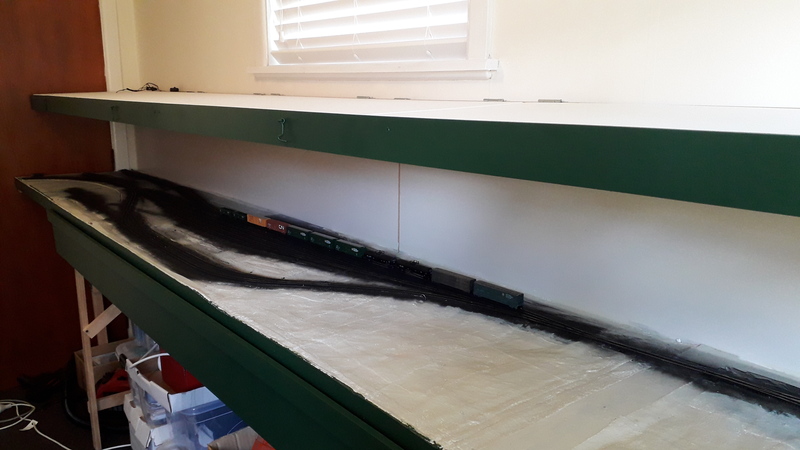 I will still paint and weather the rail sides and ties, but a coat of flat black spray paint is a quick way to get rid of the shiny model train track look. The room preparation and point blade masking is the most time consuming part of the process.